The Best VPN add-ons for Firefox | ComTek Computer Services Inc.
Firefox users have access to a selection of VPN add-ons for the browser which they can install from Mozilla's official add-ons repository. Whenever a connection to a virtual private network is established, it will be used as the entry point to the Internet. Websites and services that users connect to will reveal the IP address of the VPN server and not the local one. That's great for a number of purposes. Since you connect to a server in a specific location, you can access contents that are restricted to that location. A vpn server in the United States lets you access contents restricted to users of the USA even if you are in another country. Security too is improved as your connection to the VPN is encrypted usually so that others listening in on the traffic don't see clear-text data flowing by. Users of the Firefox web browser, much like Chrome users, have access to several add-ons that provide them with VPN-like functionality in the web browser. The main appeal of these solutions is that they are easy to setup and use. If you sign up for a VPN service manually instead, it may be required to create a new network connection on your system to make use of it. With add-ons, you may need to create an account but that is about it. Only add-ons matching the following requirements are included in the list. The add-on needs to be available on the Firefox Add-ons website. The add-on needs to be compatible with Firefox Stable. A free version needs to be provided. It may not inject advertisement or manipulate traffic or the browser in other -- shady -- ways. While Hola Unblocker is listed on the Firefox website, it is not the latest version. It dates back to November 2013 and when you install it, you will be reminded to update it to the latest version which is downloaded from the developer website. It is not clear why the company uses this system but it may raise alarm bells considering that the upgrade version is not tested by Mozilla at all. The extension adds an icon to Firefox's main toolbar by default which indicates whether a connection has been established or not. You can click on the icon to select a server location for the site you are on, and the extension remembers that selection and will establish the same connection the next time you visit that website. There is also an option to change server which is useful if the server you are currently connected to is not delivering the performance needed to access contents on the website. Hola Unblocker uses peer connections to support its service. This means that your PC may be used to stream contents for other users. The only way to avoid this from happening is to upgrade to a premium account which starts at $3.75 per month if you pay yearly in advanced. Performance: The performance was excellent. All streaming services that I tried worked fluent without pauses or buffering issues. Access to sites such as Netflix, Pandora Radio, Hulu, the BBC, Amazon.com or NBC. Proxmate supports a small selection of sites only. While you find several popular Internet services supported, Hulu, Grooveshark or YouTube for example, you may notice that it won't work with all of them. 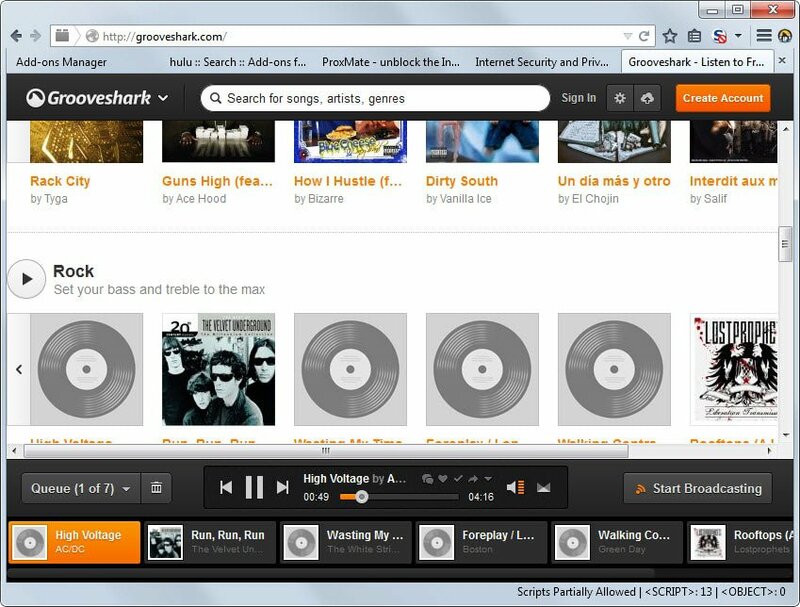 It did work fine on Grooveshark but failed to do so on Hulu for example. While that is certainly a let down for users who have installed it to access a service that is not working, it still has its uses for others. The add-on has last been updated in September 2013 which may explain why some supported services are not working anymore when you use it nowadays. You may want to check the options of the add-on. Here you find a preference enabled by default that is collected anonymous data which you can disable. The add-on for Firefox works without any user interaction. Just visit the site and if it is supported Proxmate will tunnel your connection so that you can access the contents. Proxmate uses proxies to make available its functionality. Performance: Not all supported services were working at the time of writing. Those that did , Pandora, Crunchyroll and Grooveshark for example, worked fine and without any issues however. It is surprising that only a few add-ons are available to add VPN-like functionality to the Firefox browser. The makers of Zenmate are working on an add-on for Firefox to bring their popular service to the web browser but it is not clear when that is going to be the case. 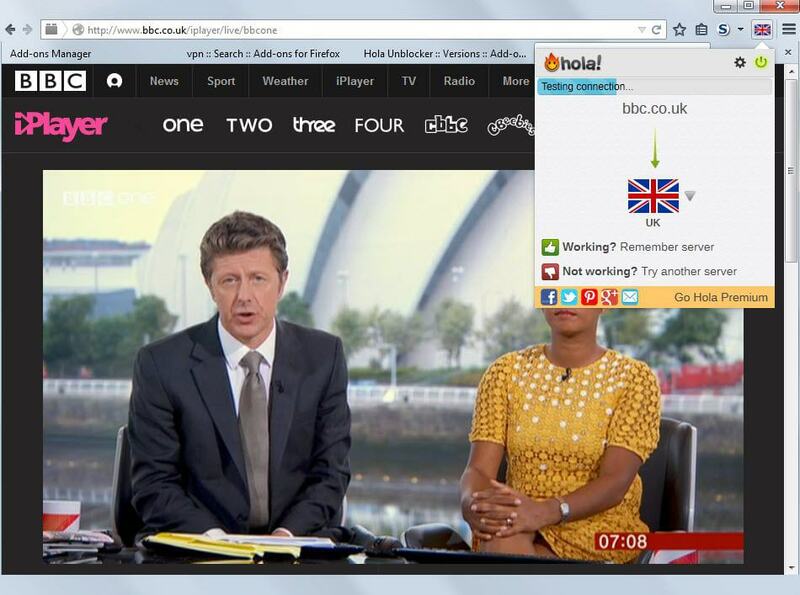 Hola Unblocker was the only add-on that worked with all services. Its main issue is that its latest version is not offered on the official Add-on repository which means that it has not been audited by Mozilla. As a Firefox user, it may make sense to install a system-wide VPN instead. There are free ones available, but they do limit the bandwidth available usually. Tunnelbear for example gets you 500 MB of free data each month which is enough to watch a show or two but that is about it. Now You: Are you using a different add-on to access restricted contents or improve your privacy and security while using the Firefox web browser? Share it with us in the comment section below.